My mother and I are both knitters. For us the bug bit early and deep. We have gone to knitting camp together. We share techniques and ideas. Every phone call includes something about knitting. We even knit at the same tension. I recall one day getting a call about ganseys. You see, my brother, Rob, had gone to England to pursue a PhD in Engineering. He would write back with requests. “Mom, please send my hockey equipment”. Ice hockey in England? Let’s get serious here. Mom carried out all the requests. But this one had her stumped. “Mom, please knit me a Channel Island Guernsey”. What on earth was a Channel Island Guernsey? So she phoned me. This was in the days when neither of us had a lot of knowledge around the history and traditions of knitting (both of us know a lot more now). As luck would have it, I had recently read a McCall’s knitting magazine article which included a pattern for a Channel Island Guernsey sweater. “Oh mother, don’t you know? I will send you the pattern.” Hah! one for me. I’m almost never ahead in this game. I was lucky – she knit me one too. Pretty good when a knitter doesn’t have to knit their own sweater. That started a lifelong interest in ganseys. And, being of Scottish background, I relate to this genre pretty easily (again hah! our family were farmers not fishers). so what is a gansey? Guernseys (or, more often, “ganseys”) were originally knit in fishing posts up and down the coasts of England and Scotland. The gansey was the utility garment of the fishing workforce. 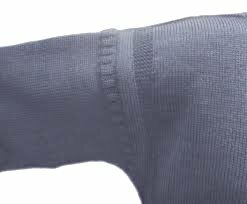 A gansey is usually knit with a hard-wearing dark blue yarn with a very tight twist. 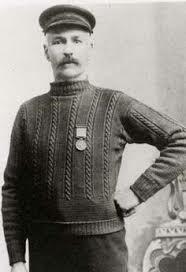 The yarn contributed to the long life of the sweater and made the sweater more wind and water-resistant, but it sure didn’t add to the wearer’s comfort! Other pieces of the design contribute to its warmth: a tight-fitting neck and body hugging dimensions with maybe an inch or ease, not much more than that. 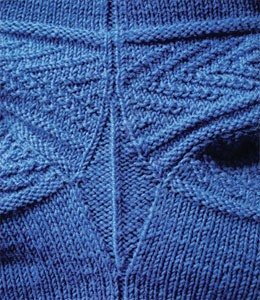 Gansey sweaters usually have diamond-shaped gussets in the underarms: when the wearer lifts an arm, the sweater doesn’t ride up. 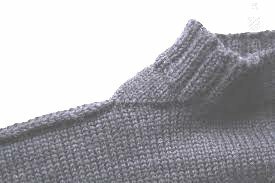 Triangular gussets give ease at the neck while keeping the neck of the sweater closed against the wind. 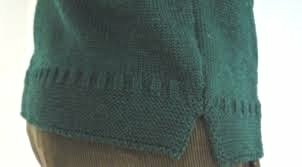 The bottom of the sweater is more varied: it could be a two by two rib or to rectangles of garter stitch called “welts”, one for the front and one for the back. These separate with the wearer’s movement. These sweaters were definitely designed for active use. There is a distinctive style to ganseys, depending on which fishing port the ganseys come from. It makes sense: when a knitter sees something she likes she copies. Gansey patterns use combinations of knit and purl stitches and some use cables, typically simple rope-like 6 stitch cables. The patterns evoke the fishing industry: seed stitch for nets, anchors and rope. My personal favourite is the Staithes which uses horizontal bands of seed stitch with a couple of garter ridges between each band. The Channel Island Guernsey is the simplest of all the ganseys: garter stitch welts, a bit of ribbing, plain stocking stitch to the armhole, two columns of garter stitch up the chest and a simple ribbed neck. The top of the sleeves is border with some more rib, then the sleeves taper to 2 x 2 ribbed cuffs. The knitters used techniques that helped the sweater last longer. After all, who wants to knit a new sweater for a family member every couple of years where the sweater is knit at 8 or 9 stitches to the inch? These knitters employed special cast ons which were thicker. Most of the historical examples use either the channel island cast on (and bind off) or the knotted cast on (I’ll post a trick on this soon). The knotted cast on is pretty and is a great addition to your repertoire. how is a gansey constructed? The original ganseys were knit by busy women. Men did the fishing – women worked on the docks, cleaning and packing the catch when the boats came in. In the times between arrivals, the women sat on the dock and knitted. There was no time for idle hands! Because it was “pick up and drop” sort of work ganseys are simply constructed with an easily memorized pattern. The body is knit in the round to the armhole without any shaping, except for the gussets under the arms. 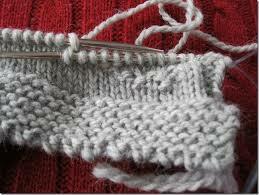 Then the knitter works back and forth, first on the front, then back and knits the shoulders together. finally, the sleeves are picked up and knit to the wrist. The sleeves taper and the gussets are closed along the way. There are no seams, only ends to darn in. When the bottoms of the sleeves wore out, the knitter ripped back to the last intact part and then re-knit the sleeve back down to the wrist. Frugal , but the patched sweater was a sight! 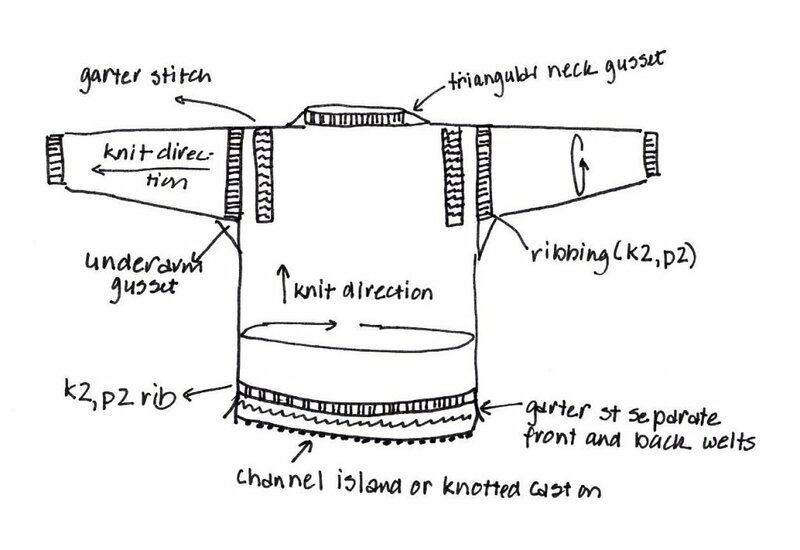 The construction method makes a gansey the perfect sweater for a beginning knitter to use to develop their chops. I can post a coming soon for Rob’s Channel Island Guernsey in my pattern shop. I’m editing the basic pattern and calculating other sizes. I’ll put a quick post in as soon as it is ready to go. There are two definitive books about ganseys that are well worth a look. 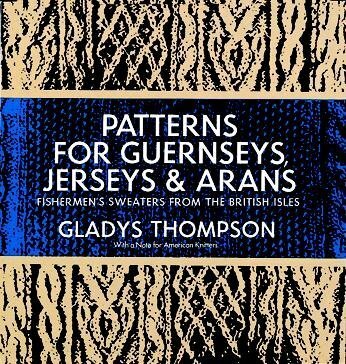 The original history is found in Gladys Thomson’s Patterns for Guernseys, Jerseys and Arans. This is an older book and the patterns were written for experienced knitters. But the stories and pictures are terrific. 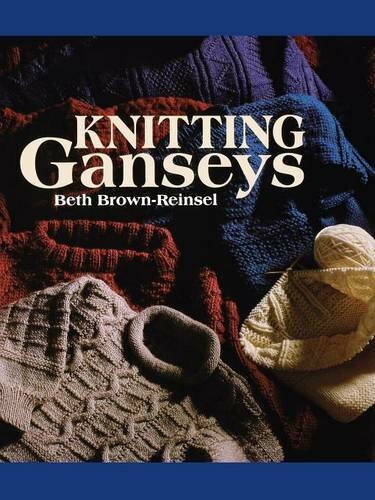 Beth Brown-Reinsel is the queen of gansey knitting. Her book takes you step by step through knitting a gansey by having you knit a miniature first. Beth often teaches workshops and has created a lot of patterns. Her website is found here: Knitting Traditions. I urge you to have a look. Beth bases her patterns on the EPS system (Elizabeth Zimmerman’s Percentage System) for calculating the stitches and rows needed for any size sweater. I’ve also used EPS to calculate the sizes for the Channel Island Guernsey. This deserves its own full post at a later date. I’ll do a more in-depth review of these two books and others later this month. You can still get the original yarn, although it is now marketed under the Wendy brand. I knew it as Richard Poppleton’s Guernsey yarn. You can buy it through Loveknitting. If you would prefer to support a local yarn source but still use the original wool try Frangipani. They ship worldwide. These are the original yarns which knit at a very fine tension and are not soft, to say the least. I based my pattern on Wool of the Andes Superwash. It’s a worsted weight so it knits more quickly than the original wool. However I’ve used 3.5mm needles so it’s pretty windproof. For kits and lot more history, try Flamborough Marine. Like Frangipani, they are a pretty complete source of information on ganseys and they offer knitting kits as well as finished sweaters.